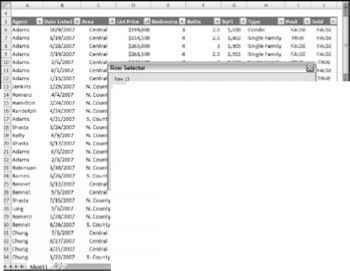 Excel 2007 features a brand new "menu-less" user interface. In place of a menu system, Excel uses a context-sensitive Ribbon system. The words along the top (such as Insert, View, and so on) are known as tabs. Click a tab, and the Ribbon of icons displays the commands that are most suited to the task at hand. Each icon has a name that is (usually) displayed next to or below the icon. The icons are arranged in groups, and the group name appears below the icons.